“Stop the violence! No more silence!” chanted students during the march at the Take Back the Night event on Oct. 3 in North Plaza. Take Back the Night is an annual international initiative that advocates for the end of sexual and domestic violence. The event represents a safe place for all and seeks to empower both victims and allies. “Violence, especially sexual violence, is very prevalent in college campuses,” said Kier Ashew, a sophomore. Ashew explained that she chose to attend because it was important for victims to destigmatize the topic. 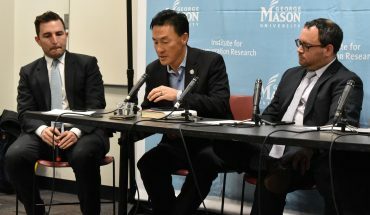 She also thought that Mason’s Take Back the Night was unique for how inclusive it was to survivors of all types of violence, including racism and deportation, instead of only focusing on sexual assault. Students had the chance to share their personal experiences and participate in a march of unity against violence. Representatives of several student organizations spoke during the gathering, including Mason DREAMers and survivors of many different types of violence. “Let’s take back the night for the women that live in fear,” said the Mason DREAMers representative. Other students delivered speeches, spoken word performances, and poetry about their personal experiences. “You are strong and worthy of happiness,” said one student speaker to other survivors of domestic violence. The Women and Gender Studies Center and Wellness, Alcohol, and Violence Education and Services (WAVES) co-sponsored the event. Stations were set up for the various counseling services Mason provides to students, including WAVES, the Counseling and Psychological Services office, and the Student Support and Advocacy Center (SSAC). SSAC is open Monday-Friday in Student Union Building I, Suite 3200. The office provides one-on-one support, interactive programming, and both on- and off-campus resources about a variety of topics, including healthy relationships, sexual assault, and drug and alcohol use. Additionally, they offer a 24-hour Sexual and Intimate Partner Violence Crisis Line that can be reached at 703-380-1434. 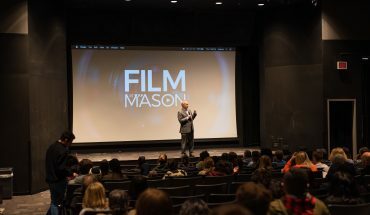 Though it is an international event, Mason has observed Take Back the Night since 1997 to promote education and support for victims on campus.